﻿ Vimel Wildlife Camera with remote access 3G Trail cameraThe 4G outdoor camera is ver..
Indoor SIM card camera - no monthly fees or subscription! Free Cloud!Introduction:Are you plann..
Wireless IP 1080P HD WIFI Spy Smoke Detector Camera.The smoke detector is the absolute best hidden ..
Wireless Floodlight Motion Activated CameraProtect your space while after everyo.. Cloud Construction Security Camera - Turnkey Solution!Are you leaving overseas, is your pro.. 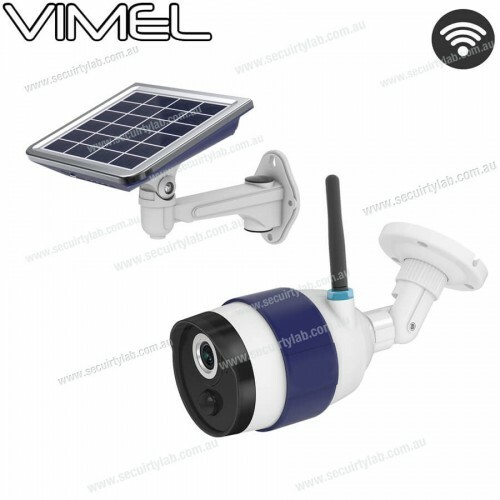 The Vimel Solar Cam is fully proof in being wire-free, you are no longer required to waste your time installing wires just so that the camera can turn on, with this device setting up is faster than ever, fully wireless will enable you to move this device room to room. You can place it anywhere where it can let you record and stream videos. The device comes with batteries that can be recharged, you can directly charge the batteries using the outlet using the Micro USB cable, or if you want you can simply use solar energy to power your batteries without wasting a cent. This device has the capability to support motion detection recording using a PIR sensor that is built-in with the camera, the device sends you alarm notifications once motion has been detected within the viewable sight, you can use two ways audio communication to scare off the intruder who is entering your property. It will not matter where you are located because you still have the ability to use your voice to remove anyone from your property using the available two ways audio that comes with this device, you can tell anyone two leave your property whether it’s an intruder, allowing safety and preventing any harm or access to your house. This device gives you an insight on to your property at any time and at anywhere, you may be overseas but you can still have a full insight to your property, you will be able live stream anytime using WIFI connection to the device, this camera fully supports wireless connectivity. The device is completely resistant to outdoor issues such as rain, it will resist to rainfall, it will no longer be a problem for you to be leaving this mount outside all day long whether its day or night. The setup uses an adjustable positioning that enables full control over this device providing maximum sunlight to provide energy for the camera. The camera functions perfectly in outdoors, it can be perfectly adjust to any property whereby sunlight can help it function during day time via solar energy, it will even function during night time for complete surveillance for over 24 hours. Record up to 2500 events (30 sec) without charging. 8 hours sunlight allows 480 event recording daily. Standby time: up to 8 months based on 10 events per day. ﻿ Vimel Wildlife Camera with remote access 3G Trail cameraThe 4G outdoor camera is very effective at capturing videos and photos at any time of the day for you, this device LIVE streams..
Indoor SIM card camera - no monthly fees or subscription! Free Cloud!Introduction:Are you planned to go on a long trip for your summer vacation? But dropped the plan for the house security problem? .. Cloud Construction Security Camera - Turnkey Solution!Are you leaving overseas, is your property exposed to intruders? Well you don’t have to worry as this camera can secure your property, you m..